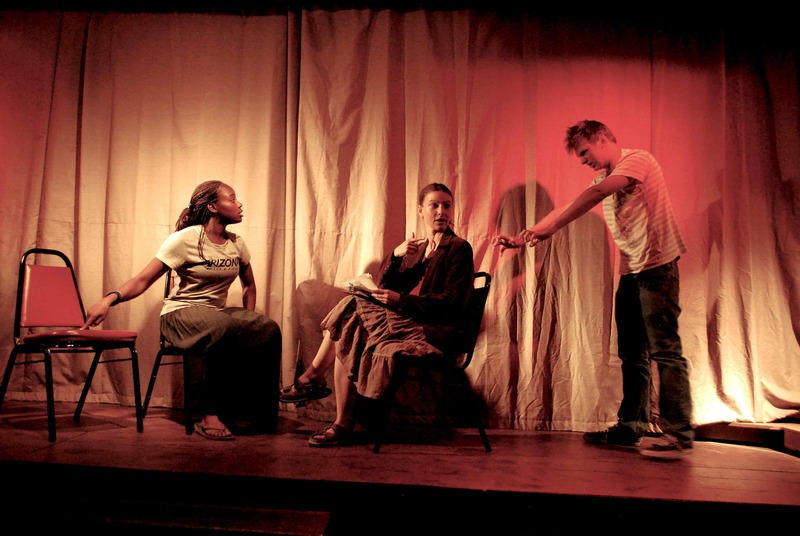 Ecstatic Theatrics began in October 2011, when I craved to do live theater again. The Firehouse Theater had closed in 2010. PERFORMANCES: 7pm, Aug. 3&4, 10&11, 24&25. August 24 & 25 will be dinner theater, serving at 6pm, for an extra cost. TICKETS: Adults $9, Teens & Seniors $7, Kids $5. 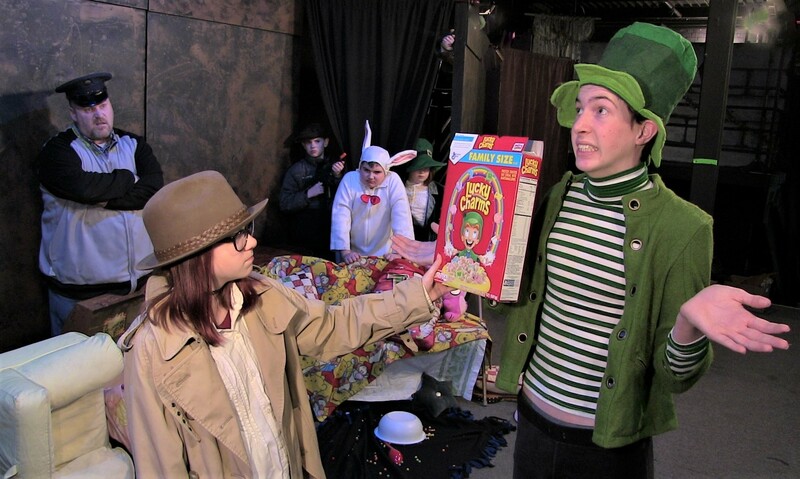 Last weekend dinner theater, $4 to $8: Irish Stew with or without meat or macaroni, fruit or salad, bread and butter, apple spice cake or chocolate cake - either w/ ice cream, coffee, milk or soda. Open Wed.-Sun. 1 to 8pm. 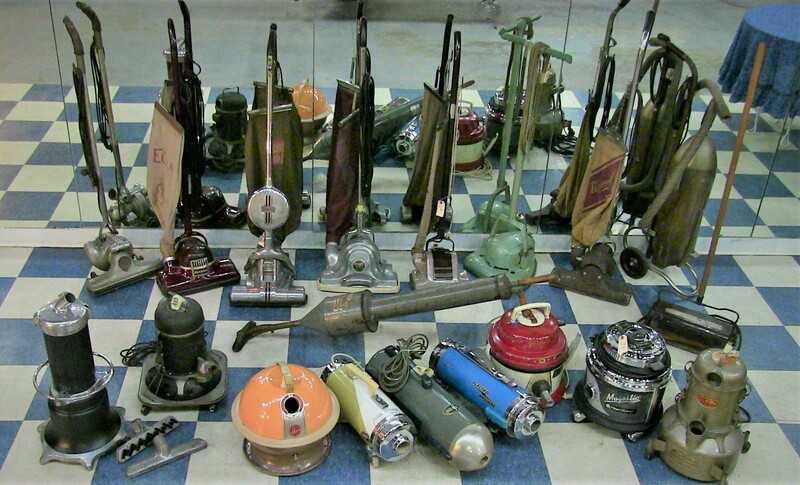 Over 160 antique vacuum sweepers from the late 1800's to late 1900's on display. 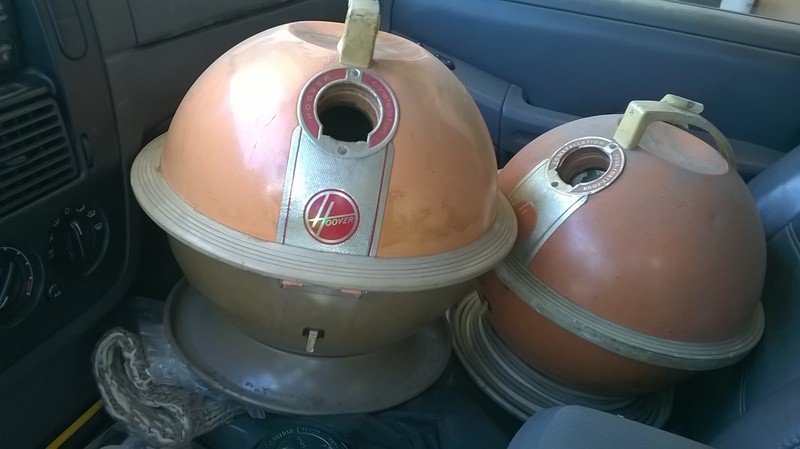 Planning a live performance of "Invasion of the Vacuums of Outer Space", last weekend, April 28 & 29 at 3pm -- Check back for updates on that. See the News-Sentinel photos & article on our exhibit! See the alien invasion photo story at www.tekventure.org. 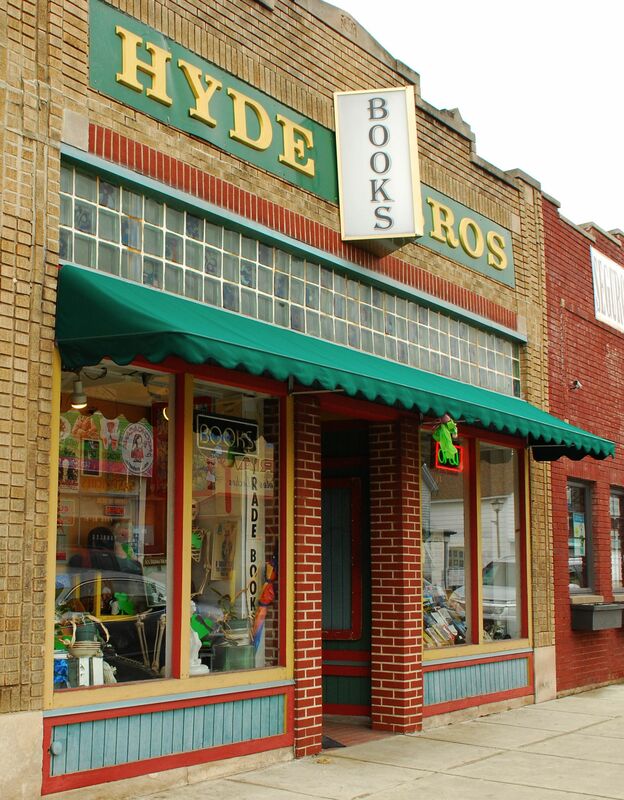 April 14 - 29, 1 to 8pm - Closed Mondays and Tuesdays. Join the cast of the play by contacting Jeannette Jaquish at 260 750-9013 or ecstatictheatrics@yahoo.com. 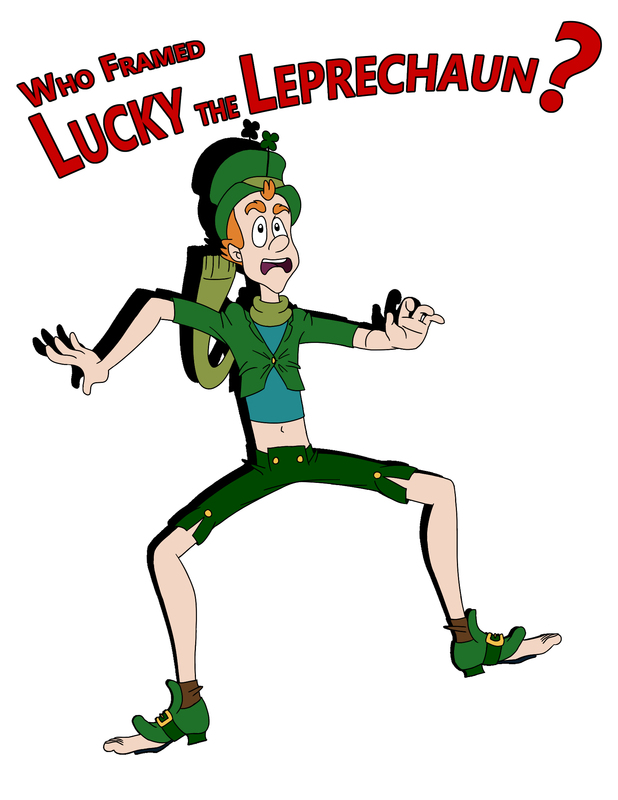 “Who Framed Lucky the Leprechaun?”. Friday, March 16, 6 to 10pm. Saturday, March 17, from 6 to 10pm -- St. Patrick's Day! $5, $20 for a family of 6. 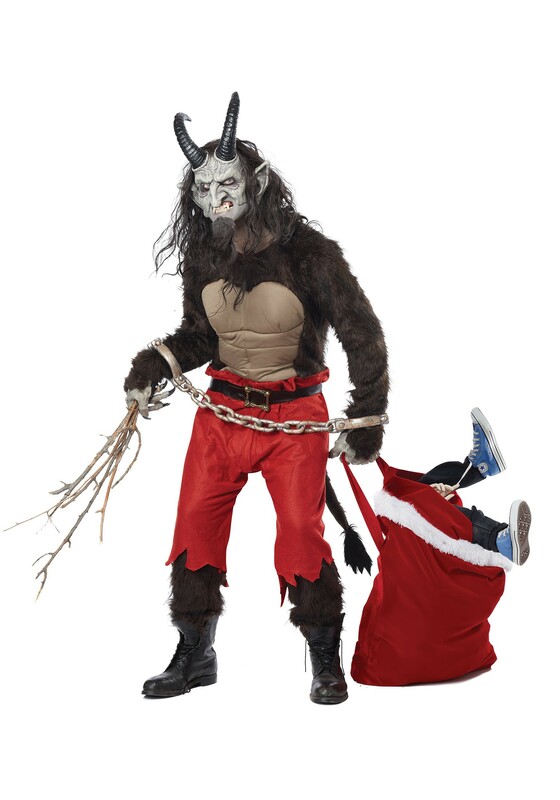 DIY or assisted Portaits with Santa or Krampus! Then use our computers to send the digital images to Walgreens or Target and go pick up cards or photos afterwards. FREE Admission & Show. Only pay materials fee if you make a gift. - The ssssPOOF! -" <-- Click! --Including a few slightly disturbing humorous moments. -- In July or August of 2017, Jeannette Jaquish read an article about the new location of TekVenture, at 1550 Griffin St., in Fort Wayne, IN at a former night club in the River City area, and that it had an unused stage. Within 90 minutes she had called and was on that stage scoping out its possibilities. She got permission, put away all the clutter, cleaned, put up lights and scenery, and auditioned and rehearsed its first theatrical show. Tickets were $5 for age 17 and under, and $7 for adults. The show earned $920 for TekVenture!!! "Harry Plotter and the Obnoxious Voice"
Order DVDs of this full length movie. What address do I mail it to? and Snow White and the Eco-Disaster Dwarves! and March 28, 3pm at Little Turtle Library at 2201 Sherman Blvd. In "Snow White and the Eco-Disaster Dwarves" a lost little girl discovers the forest is not scary, it is dying, and bumbling dwarves come to the rescue. Free. Donations accepted March 15. 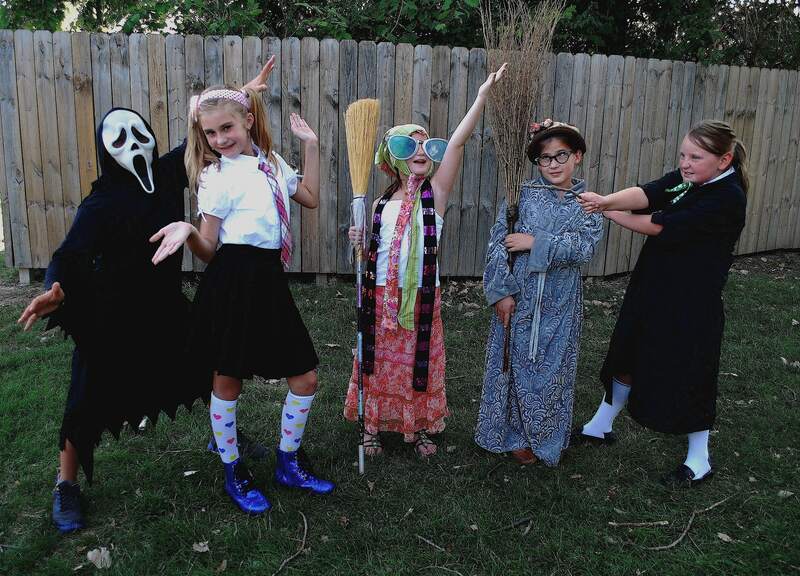 Photo by Jeannette Jaquish: L to R: Evin Butler, Elaina Blacketor, Wolf, Autumn Byer, Carolann Byer. SEEKING SPONSORS: Sponsor a FREE or Reduced Price Show for $60. 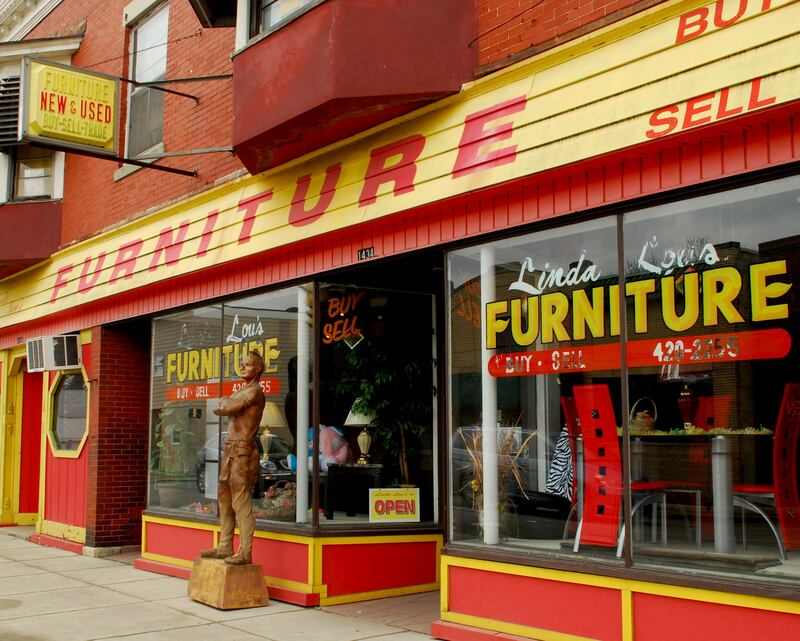 Or call Jeannette at 260 750-9013. "Slipperzzzzzzzzz! 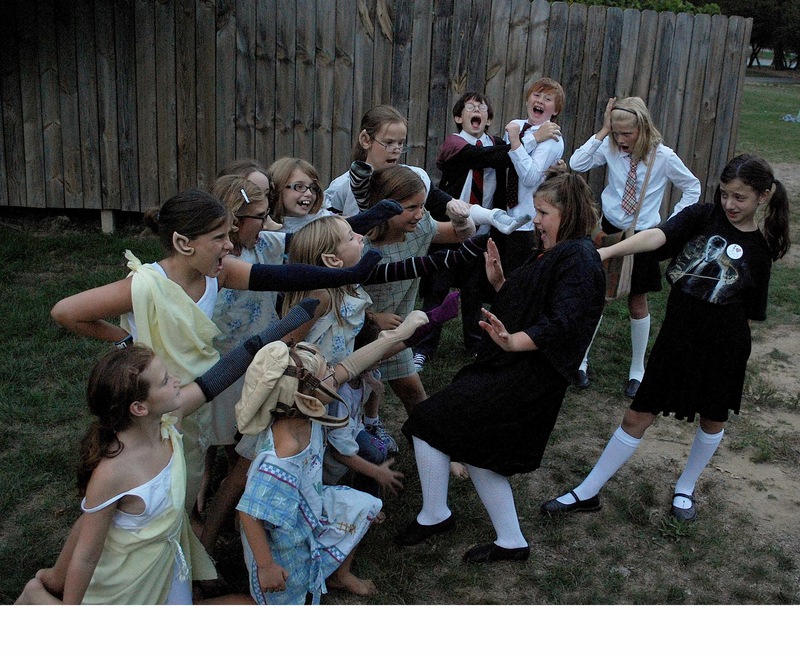 ~ Cobb and the 12 Dancing Princesses"
a comedy action musical by Jeannette Jaquish. wearing their shoes to tatters. 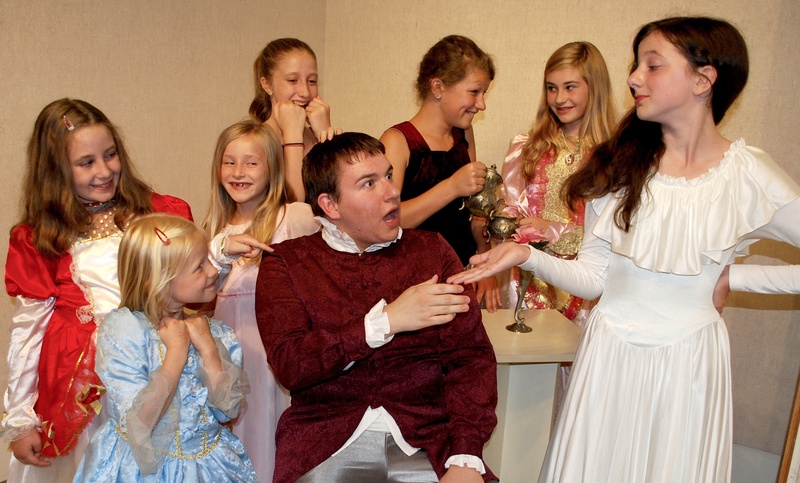 Instead of observing the sneaky princesses who wear out their dance slippers nightly, Prince Haagen (Brandon Johnson) is distracted by the wiles of Princess Jonquil (Chloe Cameron) while two of her sisters (Paige Trammel and Anna Boeglin) pour sleeping potion into his drink as other sisters (L to R) Autumn Byers, Katie Trammel, Elaina Blacketor and Carolann Byers laugh in anticipation of a night of dancing.
" . . some laugh out loud lines." A GREAT SHOW! ~ Now it is over. Please email ecstatictheatrics@yahoo.com to get on the contact list for our next show. 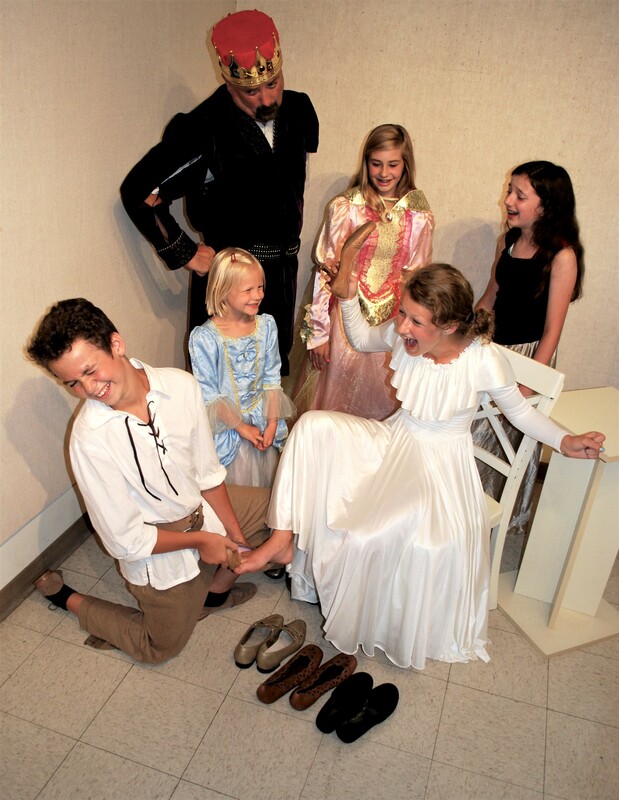 Jonquil (Paige Trammel) smacks Cobb the Shoemaker (Sam Smiley) for embarrassing her in front of her stern father the King (Scott Wiley), and her sisters (Kate Trammel, Anna Boeglin, Chloe Cameron) who think the young boy's crush is hilarious. UGLY GIRLS - Cobb! Don’t leave us! COBB - Sorry girls, Someone else will come along. MAYOR - How can you reject our beautiful HobNobbit young ladies? WOODCUTTER - ... any farm animal! KING LEO - It is extremely important, Prince Haagen, that you do not fall asleep. My daughters are smart, charming, wily, little weasels. Do not trust them an inch! FIRST PRINCE - Um... Yes, Sir. KING LEO - So much I have done for them! I have invaded smaller countries with my armies dressed as marching bands. I have signed peace accords and then took their royals hostage. I have spread rumors and false evidence to create rebellions that overthrew other rulers so I could more easily conquer them. I kidnapped the most beautiful loving wife to be my children’s mother! All this to give my children safety, riches and power! And what do they reward me with? Lies and trickery! Still I love them. I fear one night they will disappear and not come back. It will destroy me. AZALEA - Poor boy. He tried so hard to stay awake. BLUEBELL - And now he’s going to the dungeon! CLOVER - No he’s not. We don’t even have a dungeon. Papa is scared of the dark so he’s never looked inside. DAHLIA - It’s just the mop closet. A hundred years ago a boy wrote “Dungeon” on it for a joke. LURK - There you are! PotScraper you crazy old woman! OLD LADY - I’m crazy all right! Crazy enough to split your head open if you come any closer! LURK - Give it back and I’ll be gone. OLD LADY - It’s gone! Long gone! I tied it to a squirrel’s tail and he ran up a tree. I’m sure he made it into a nice nest. Start climbing if you want to find it. Look for the invisible squirrel! BANDIT 3 - Where’d the twit bloody well go? BANDIT 4 - Left, right and centre! Find him! I’m gormless. Where did he go? BANDIT 1 - It’s a bad turn, it is. What if we disappears also? BANDIT 2 - There’s a witch what lives in this wood, that eats children. COBB (loud Witchy voice) Heehee hee hee! This is my forest! And I’m hungry! "I loved it when Snape came after Ron, after Ron turned him into a girl!" 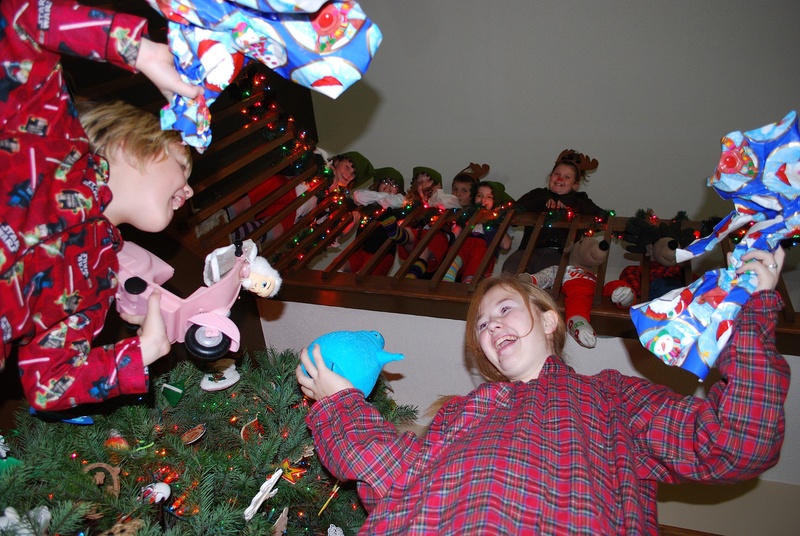 "The kids did an amazing job as House Elves singing and dancing to 'It's a Time Clock Life.'" Outside at the camp bleachers on the far west side of Franke Park. Bring a lawn chair if you like. 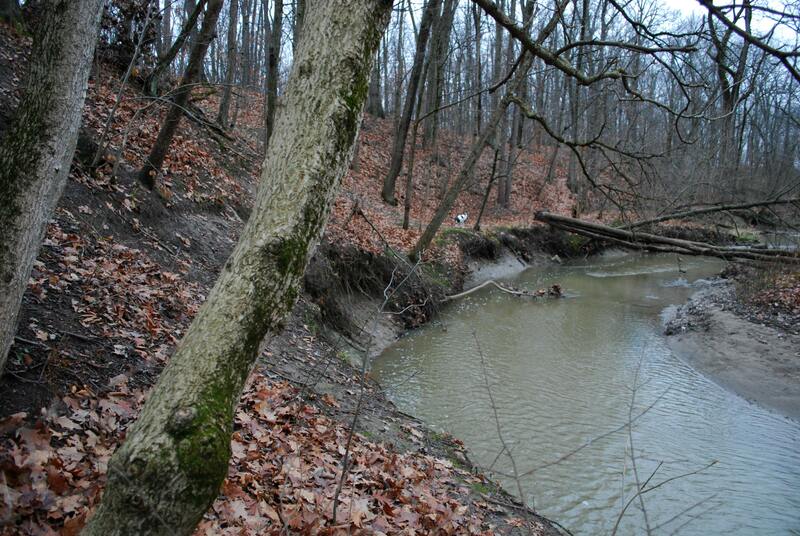 Franke Park is off Sherman Road north of State St., across from Franke Park School. -- Enter Franke Park, pass the zoo, take the left fork and follow the road ALL THE WAY around to the buildings and the little parking lots. If you see the duck pond, go back the other way. Harry is once again locked in his room where Dobby & an inebriated Winky come to him with a warning to save not his life but at least his career. 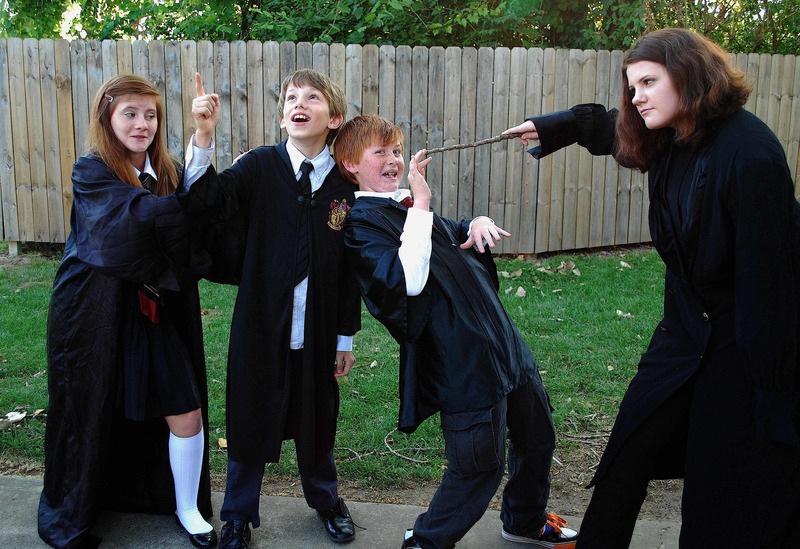 At Hogwarts things are weirder than ever, Snape is furious at Ron's spilled potion, Hagrid doesn't think Harry's "hearing voices" thing is funny, Dumbledore has lost his meal ticket as well as his mind, Luna dissects the brown bag lunch, Myrtle wants to be Best Forever Haunt Buddies, Malfoy has a fancy-schmancy new "mission", Time is twisting, and the House Elves battle Peeves, a Three-Headed Dog and whisper about "The Master". ---for special needs & noisy. Ticket ordering Online is Closed Now. There are plenty of good seats yet, so just come and pay at the door! ----Large Family or Group Discount - Call 484-5946. Thursday, March 1: FREE Show for Special Needs - Too noisy for most audiences. For those whose condition makes them a distraction to others, accompanied by a companion or two. Call to make reservations: 484-5946. LOCATION: Main Library Auditorium, Ewing/Wayne/Washington. Bring your library card for free parking. 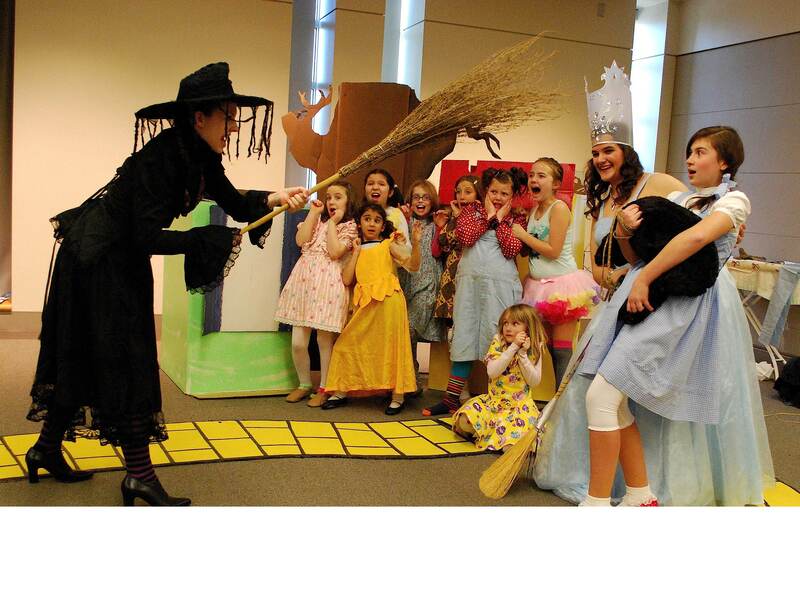 The Wicked Witch (Emma Norder) demands the ruby slippers from Dorothy (Alia Davis) and the smirking Glinda (Michelle Bonahoom) to the terror of the Munchkins (Autumn Byer, Emma Weldon, Dayani Guevara, Amber Antonios, Carolann Byer, Grace Sarrazin, Emma St. Peters, and Elaina Blacketor on the floor) during rehearsal for Ecstatic Theatrics' "Wizard of Oz" production performing March 1-4, at the Main Library. 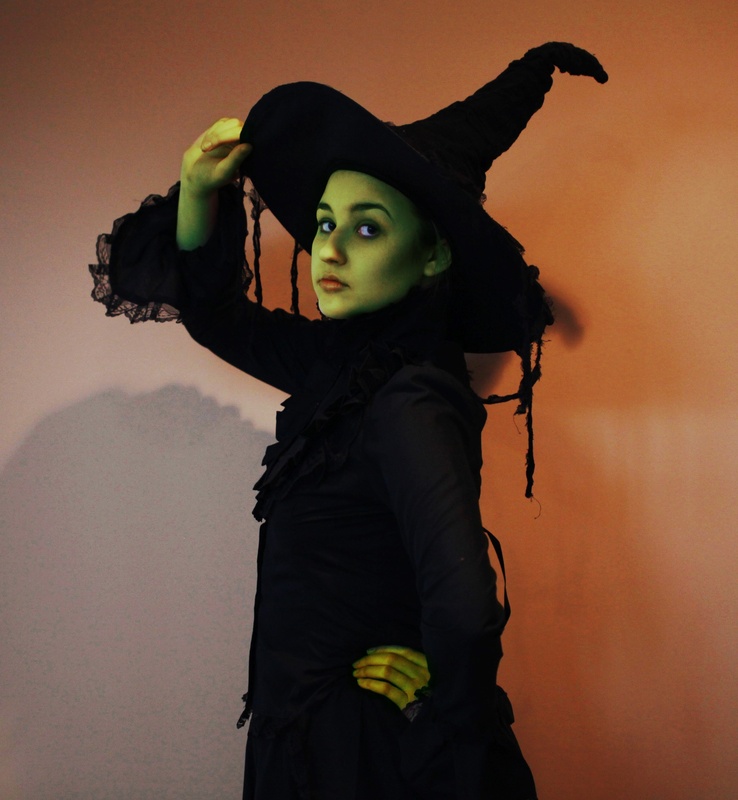 Brittney Bressler, 15, plays the Witch March 2, 3, & 4 ( and played Aunte Em in the April 2012 show). 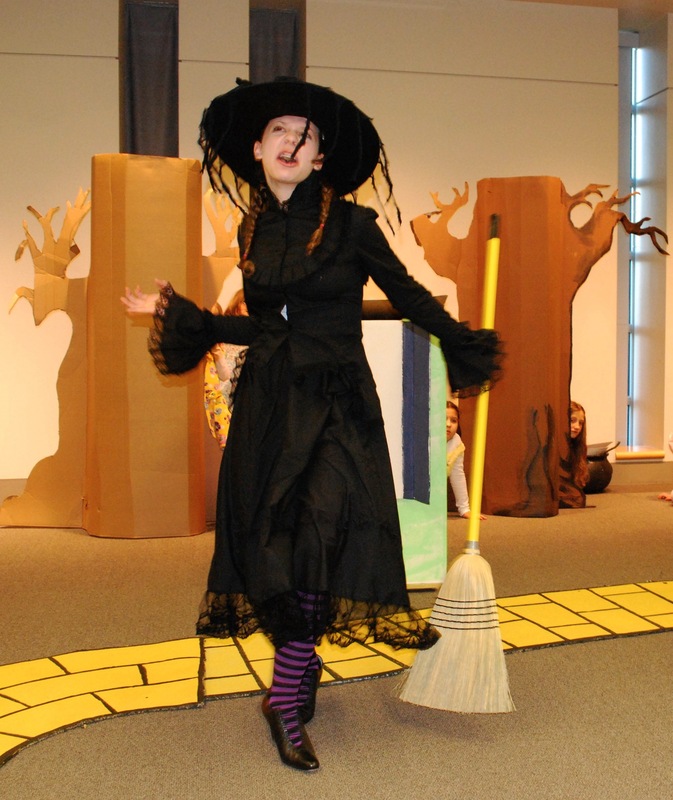 Emma Norder, 13 doubles as Dorothy with Alia Davis, and doubles as the Witch with Brittney Bressler. Here in rehearsal she can be seen wearing Dorothy braids and the Witch's costume. Earned over $4,000 at the door plus $200 donation and about $150 in ads. Spent about that: $1900 for stage rental, $360 for insurance, paid techies, costumes. Broke even. 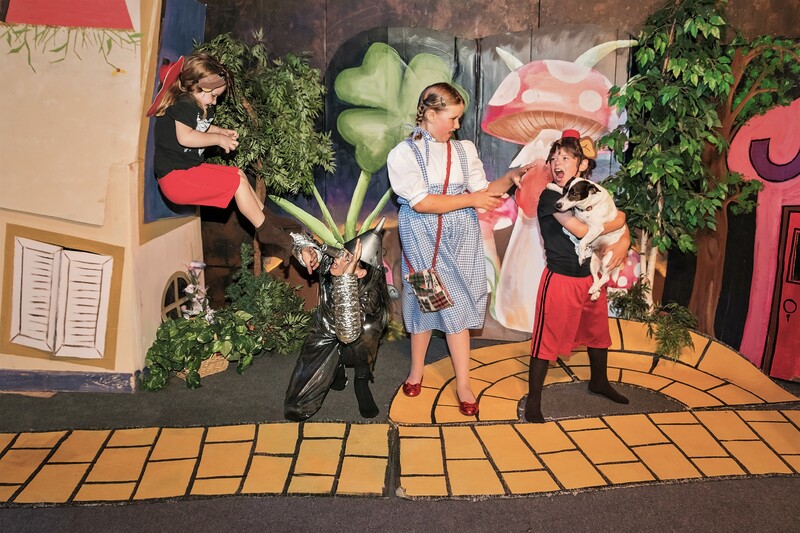 OUR 2nd Wizard of Oz Show! WARNING! Spring Street is blocked off just east of the campus right now. ALL ABOUT The New Musical Wizard of Oz! 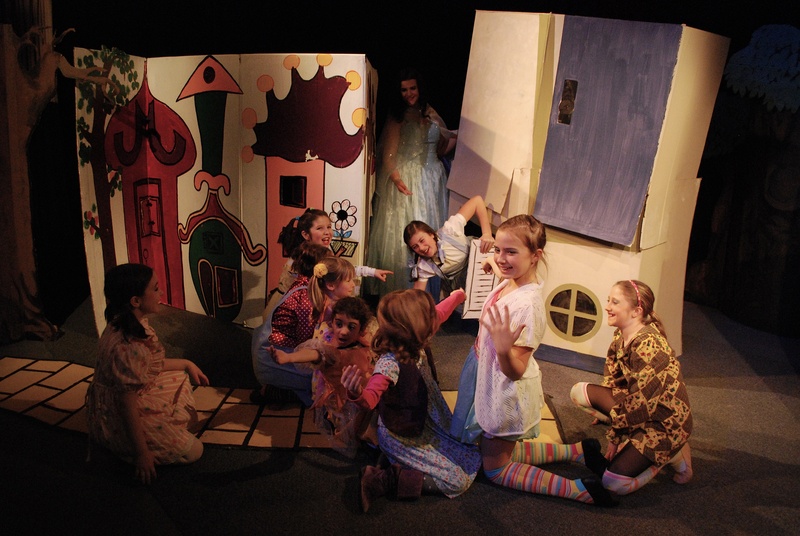 This very funny action-packed show opens with a startling Kansas scene showing Dorothy's impulsive lovable personality that keeps getting her into trouble. A persistent vacuum cleaner salesman vexes Auntie Em and then tangles with a flying broom, then later tricks Dorothy with a false story that keeps her from making a terrible decision. The tornado races through the audience as well as Kansas like a three ring circus gone wild, plopping Dorothy into a terrified Munchkinland. 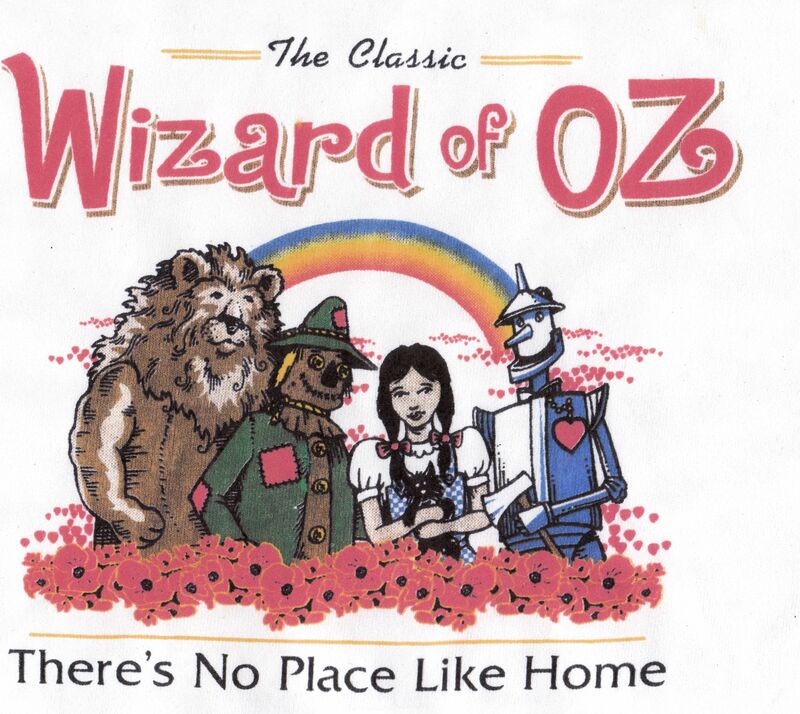 Soon she meets the exuberant Scarecrow, earnest Tin Man and cringing Lion who dedicate themselves to protecting this little girl in a strange land. This production cleverly weaves long beloved folk tunes and classical music with new music, adding beauty and excitement (and lowering the ticket price) of this newly revised production. Beautiful old songs like "Simple Melody/Musical Demon" by Irving Berlin, and "Grandfather's Clock" by Henry Clay Work are rescued from slipping into an undeserved oblivion by being adapted into this play which is destined to gain popularity. Many of these are duets and it has been a real pleasure watching the younger actors' eyes switching back and forth from singer to singer, each singing a different tune and lyrics, in rehearsal. 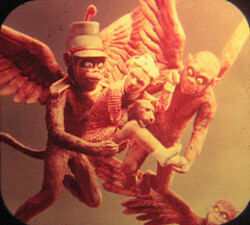 Orchestral classical music as well has found new life in this script driving the Tornado scene, Flying Monkey Attack, and the Great and Terrible Oz's Presentation. 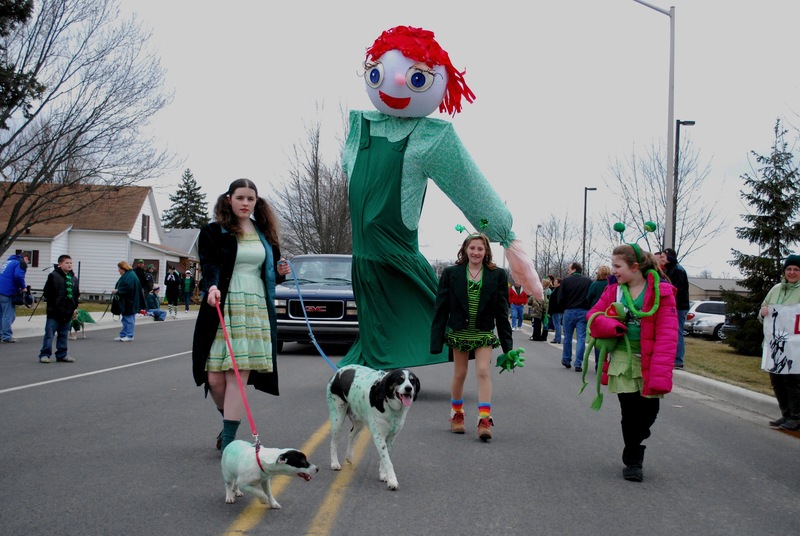 ECSTATIC THEATRIC struts its giant puppet stuff at the St. Patrick's Day Parade at Deer Park Lodge, March 17, 2013! Actresses Autumn and Carolann Byer joined Zephyr Jaquish with green dogs Spot and Amphetrious. Tom Jaquish is inside giant puppet girl. Jeannette Jaquish also marched and shot this photo. 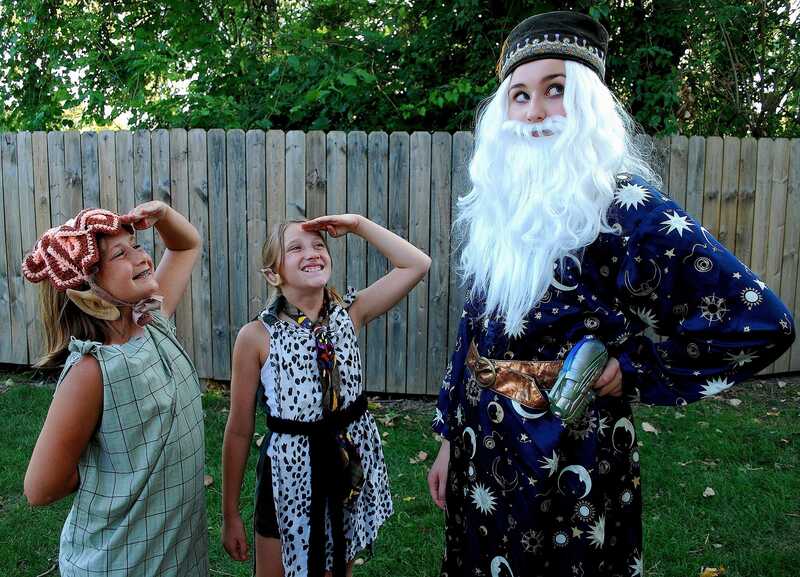 -- “Harry Potter and the Obnoxious Voice ~ the sssPOOF!” at outdoor bleachers at Franke Park, August 2012. 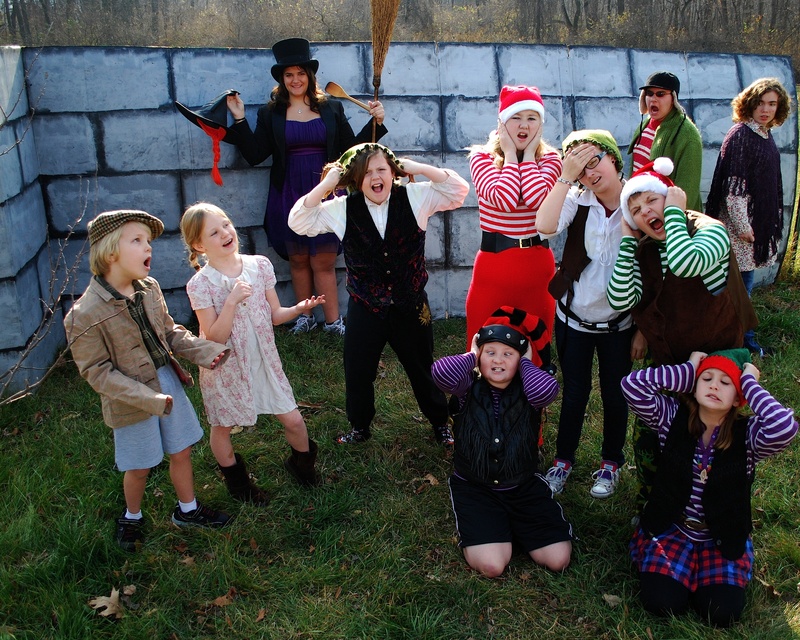 -- “SNAFU in Santa’s Workshop” and “Hansel & Gretel and the Falling Christmas Elves” at Cinema Center the Main Library in December 2012. Four shows in 12 months, just like Youtheatre. 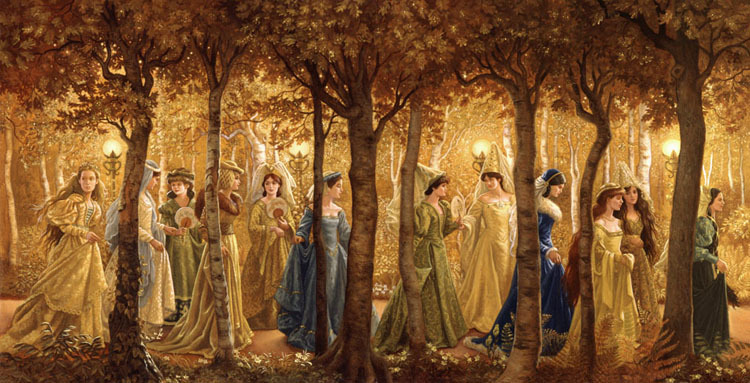 I am working on the screen play of a film-style video of “Wizard of Oz” to shoot spring-summer-early fall 2014?, shot in the incredibly beautiful and potentially creepy Franke Park woods, plus other locations for Kansas, Emerald City, Wizard’s Throne Room and Witch’s Castle. The script, directing and rehearsals are hard work, but no problem. Been there done that. It is the realistic sets (cardboard scenery won’t do it ), and actual buildings that will require great imagination and hundreds of man-hours to attain. A believable Munchkinland in the woods will require days to create, then we carry it home and then back to set up for the shoot. I also need a competent technical and support crew such assistant directors, audio & camera operators, costumers, set builders, organizers, scouts and so on. I could delay this project and do it in 2014, but I would like to do it this year. I have a history of not giving myself enough time to do a project right -- everything takes 3 to 5 times as long as I expect, but usually I was doing most of the work. If I had competent help, if I could hand a sketch to someone and a pile of materials and they put it together, if I told a group of actors to come back on Friday memorized and they did, if people were out scouting the indoor locations for me, well, it could work. I am working on a shooting script and if I can get everything figured out: script, camera shots and locations, effects such as flying monkeys and witch, Wizard’s giant head, castle corridors, huge Emerald City on a hill, Glinda appearing, TORNADO!!!! -- If I can figure out how we’ll do EVERYTHING, then it will be a go. Because if one thing doesn’t work, the whole thing can’t be finished. I know I can get actors. What I need assurance of is a technical video and theatrical crew, skilled, dependable, available. I will be able to pay the crew, because this is intended to be a mass distributed production. Maybe not on movie screens but DVD distribution. I write good scripts. The rest is the hard part. If you are interested in helping, please email me at ecstatictheatrics@yahoo.com or call me at 260 750-9013. Dec. 15, 20* & 29, 2012! Two Modern Children's Holiday Classics! * The dopey duo of Hansel & Gretel drive Santa's Elves to madness and send their parents into The Awful Offspring Protection Program. Only the Narrator knows a happy ending is in store! 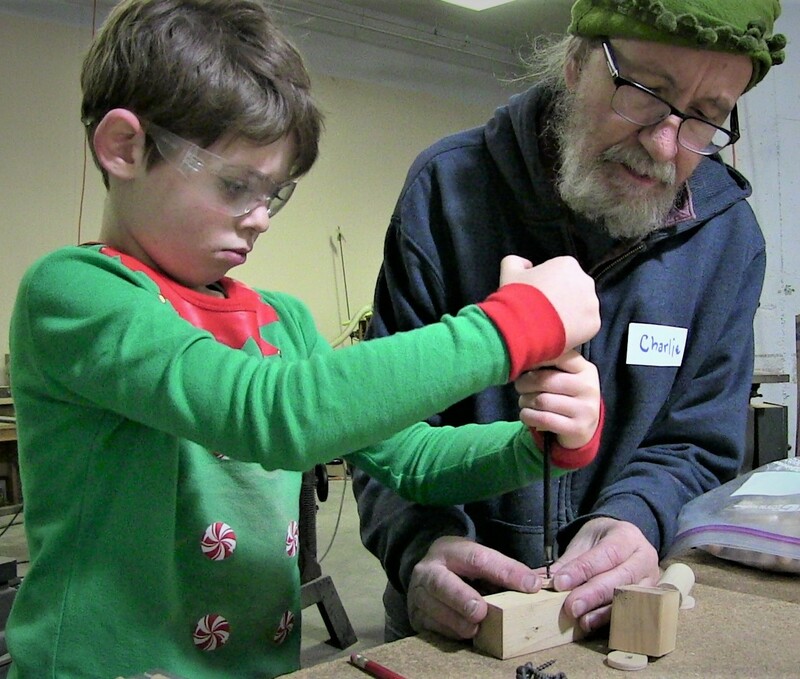 *SNAFU in Santa's Workshop: Will Quigley's invention save Christmas even after it is short circuited by hot cocoa??? 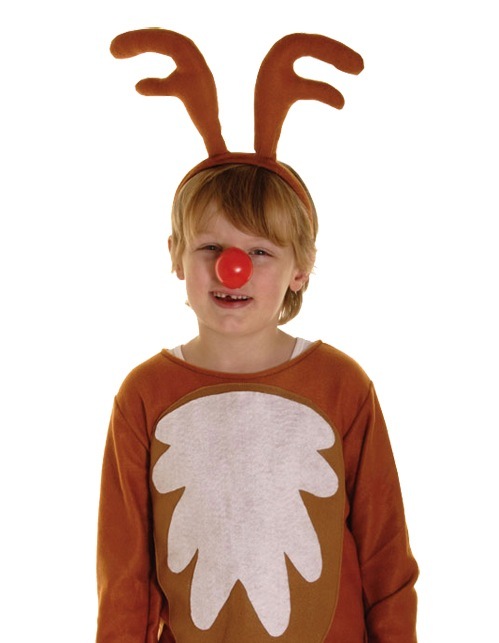 It's the Raucous Reindeer to the Rescue -- so you'd better RUN! 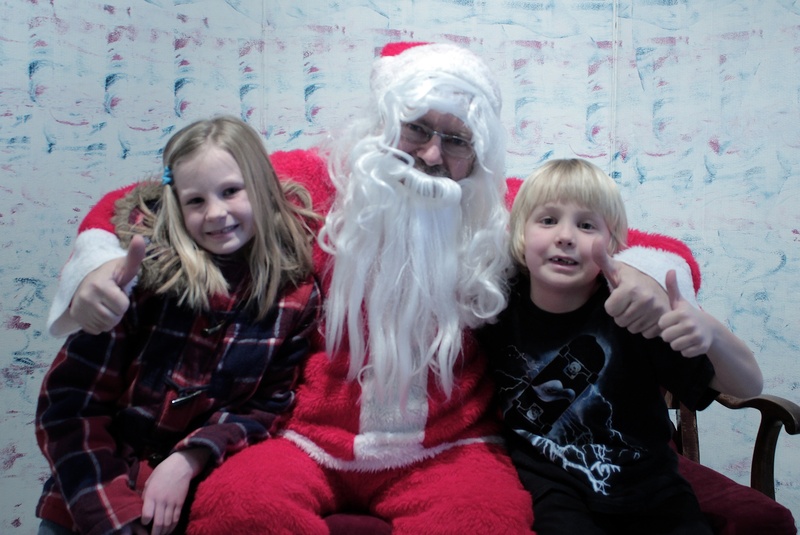 --- FREE SANTA PHOTOS after the show! We shoot 'em and email them to you free! 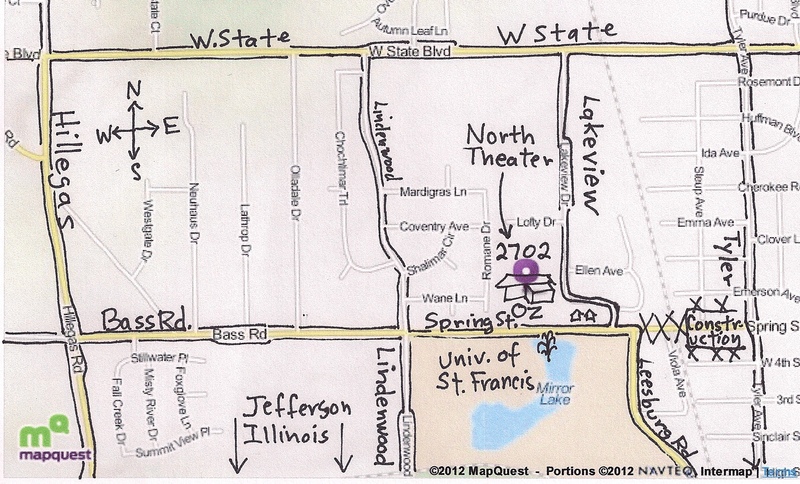 Dec 20: Main Library Meeting Room A: 7 pm --*Special Needs get in FREE! 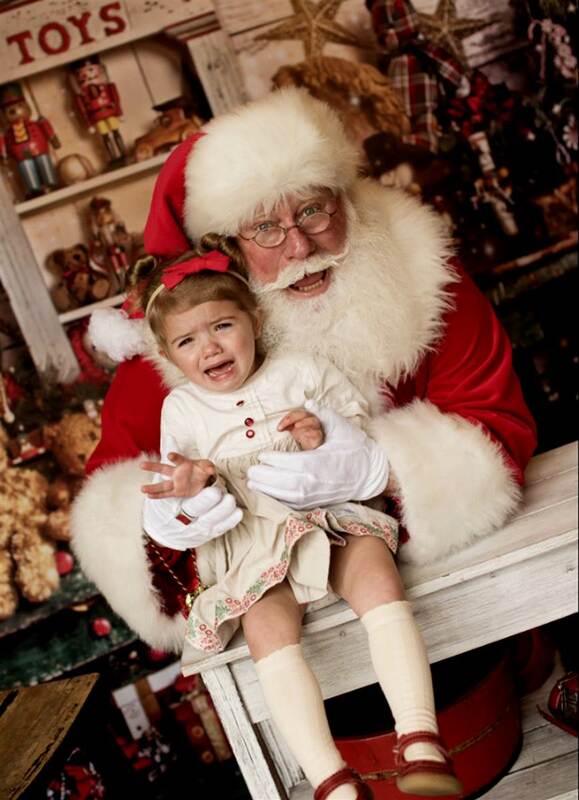 After the 1 hour show: FREE PHOTOS with SANTA! We shoot them and email them to you free! TICKETS: $4. Free for Special Needs Dec. 20 at the Library show. NO RESERVATIONS necessary. Questions??? -- Call 260 750-9013! WITCH - Brittney Bressler -Dec 15, 29. Jeannette Jaquish -Dec 20. 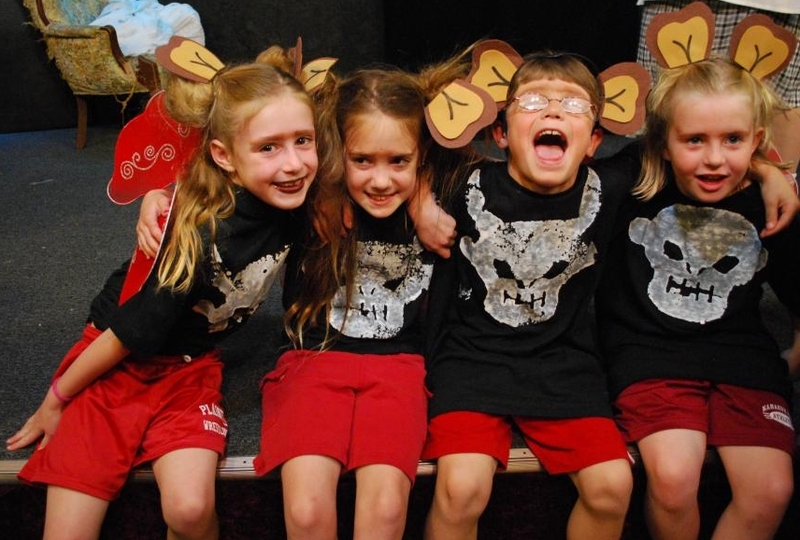 I and some of my old Firehouse kid actors were performing "Don't Look in the Lake" for Fright Night at the outdoor stage of the Main Library, on a Saturday, the week before Halloween 2011. I scheduled an organizing meeting to start Ecstatic Theatrics. The notice ran in Whatzup? and the News-Sentinel Ticket, that I know of. Only one other person came besides the kids rehearsing and two parents; that one person was also a past actor of mine. But they were a crackin' good group of actors and very enthusiastic, so why not? I'd never do anything if I waited for support. Nov. 6 I traveled to Jackson, Ohio to see the Jackson Theater perform my Harry Potter parody, with three new scenes that I had written but never got to direct or see performed. They did a great job and I was happy to see my three new scenes blended in fine. The actors and members of the audience greeted me with affection and praise, someone paid for a hotel room and dinner for me. It was amazing. They had full houses and I wanted so much to produce it here. 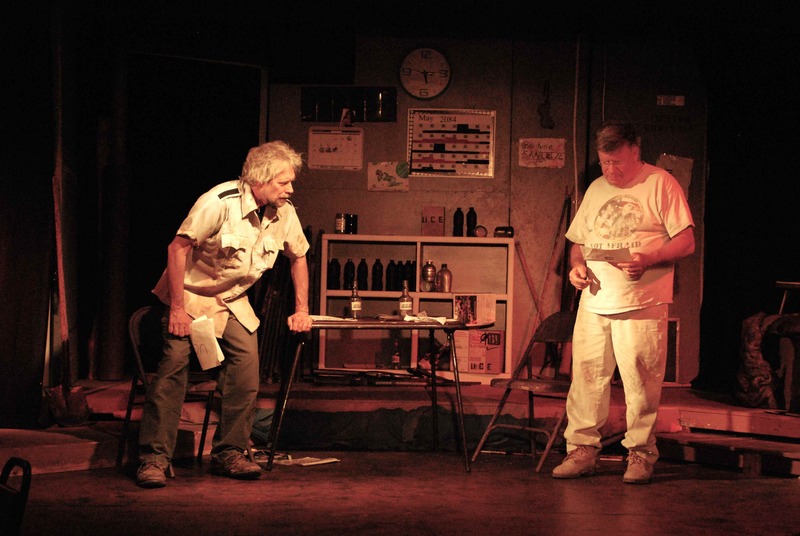 When we first performed the script in Fort Wayne, the first performance had only family of the actors, like most of the Firehouse productions. I videotaped the Jackson show, edited it, and played it on my "Firehouse Presents" Access Fort Wayne TV show. I finally got this new ecstatic-theatrics website up. Did auditions at the Main Library for my Wizard of Oz adaption. Got a great cast. ------To see our past shows, please go to History! See Jeannette's old Firehouse Theater website. - Take each volunteer's availability schedule and schedule them into the production. Send the schedule to volunteers. 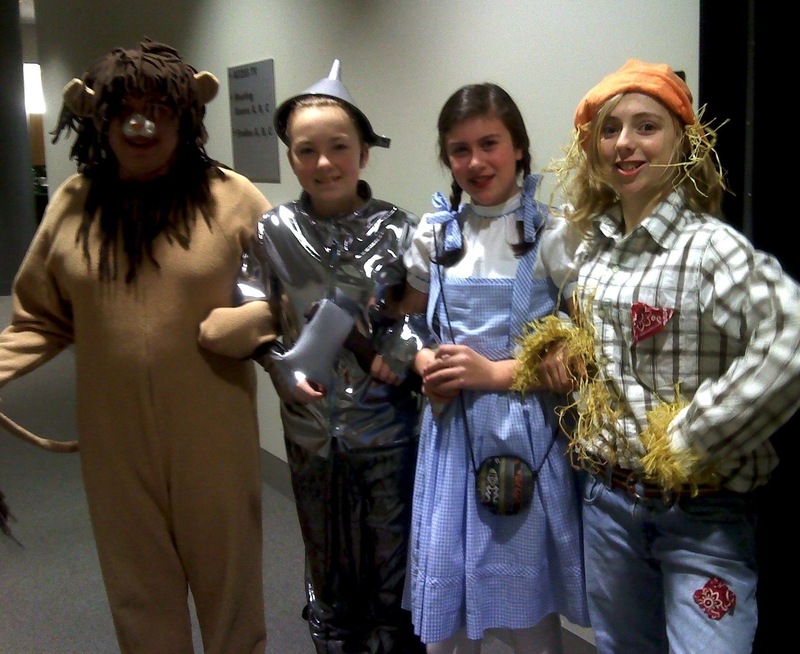 Filming Wizard of Oz on Location in 2013! Postponed one year to get everything ready. 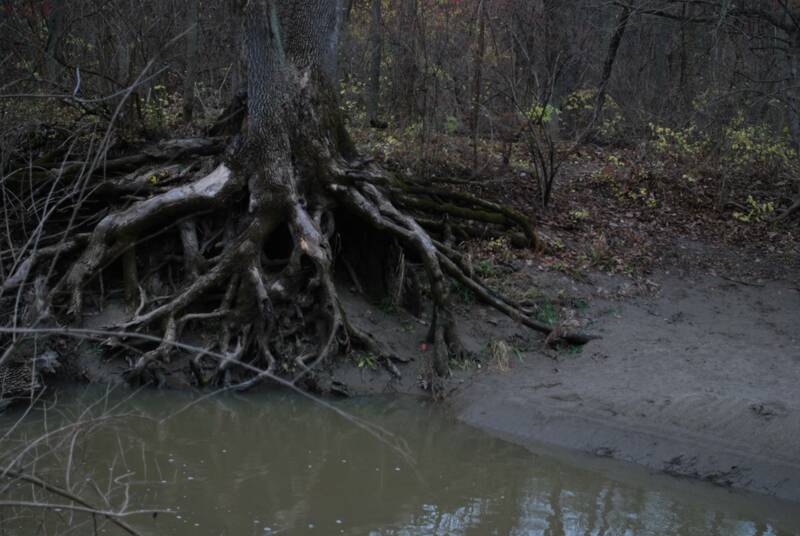 Scenes in Kansas, Witch's Castle and Wizard's Throne Room to be shot at other locations. Filming over the Spring, Summer & early Fall of 2013. Auditions beginning of April 2013. We need volunteers to help. Also hiring underpaid crew. Please call Jeannette at 260 484-5946 or email ecstatictheatrics@yahoo.com.